-The French pronounced it “aw” but spelled it “ac”. The British heard it pronounced “aw” so they spelled it that way. Whichever way you see it spelled, it is always pronounced “aw”. -Mackinac is Canadian French, short for Michilimackinac, from early Ojibwa “Missilimaahkinaank” which means “at the territory of the Mishinimaki”. The Mishinimaki was an extinct division of the Ojibwa formerly living in this region. -Like many historic places in the Great Lakes region, Mackinac Island's name derives from a Native American language. Native Americans in the Straits of Mackinac region likened the shape of the island to that of a turtle so they named it "Mitchimakinak" (Ojibwe: mishimikinaak) "Big Turtle". Andrew Blackbird, an Odawa historian, said it was named after a tribe that had lived there. The French spelled it with their version of the original pronunciation: Michilimackinac. The British shortened it to the present name: "Mackinac." Michillimackinac is also spelled as Mishinimakinago, Mǐshǐma‛kǐnung, Mi-shi-ne-macki naw-go, Missilimakinak, Teiodondoraghie. The predominant historic tribes in this area were three Algonquian peoples, known collectively as the Council of Three Fires: Chippewa (Ojibwe in Canada), Ottawa (Odawa), and Potawatomi at the time of French contact in the 17th century. These peoples had long frequented the surrounding region, which they called Michilimackinac, to fish, hunt, trade, and worship. Mackinac Island in the straits appeared to have the shape of a turtle. The Native Americans here had a creation myth based on the sacred turtle. The Straits of Mackinac was the center of two routes vital to the fur trade: one to Montreal in the east, by way of Lake Nipissing and the Ottawa River valley; and the other to Detroit in the south via Lakes Huron and St. Clair. The first European to pass the site of Mackinaw City was Jean Nicolet, sent out from Quebec City by Samuel Champlain in 1633 to explore and map the western Great Lakes, and to establish new contacts and trading partnerships with the Indian tribes of the region. His reports resulted in the French government providing funds to send settlers, missionaries, traders, and soldiers to the Great Lakes region. Father Jacques Marquette had established a mission on Mackinac Island in 1671 (which was shortly thereafter moved to St. Ignace on the Michigan peninsula, where it remained active until 1705). The construction of Fort de Baude at St. Ignace in 1681 was an attempt by the authorities of New France to establish a military presence at the Straits, but it closed in 1697. Mackinaw City's first European settlement came in 1715 when the French built Fort Michilimackinac. They lost it to the British during the Seven Years' War, and the British abandoned the fort in 1783, after the American Revolutionary War resulted in independence of its Thirteen Colonies. The site of the fort in present-day Mackinaw City is a National Historic Landmark and is now preserved as an open-air historical museum. As with the forts at other settlements of the era and region such as Detroit, Michilimackinac was a fairly small post. It housed French civilians inside the fort, and allowed them to garden, hunt, and fish outside the walls. It was a trading post for the fur trade. At the end of the French and Indian War (1754–1763), the British took possession of the fort, but continued to allow the French civilians to live within the walls, as they had good relations with the Odawa and Ojibwe for the fur trade. As a part of Pontiac's Rebellion, Chippewa and Fox warriors captured the fort on June 2, 1763 in a surprise attack during a game of baggatiway or lacrosse; the British at the fort were taken prisoner and mostly killed. Europeans, in the form of French and Scots-Irish traders from Detroit and elsewhere, did not return until the following spring, with the understanding that they would trade more fairly with the Native Americans. The British abandoned the vulnerable site on the mainland during the American Revolutionary War; from 1779 to 1781, the troops moved the fort, including its buildings, to Mackinac Island, where they established Fort Mackinac. What the British did not take with them, they burned; that way they could prevent the American rebels from using Michilimackinac as a base. In 1857, two men by the names of Conkling and Searles platted what would become Mackinaw City. The original plan reserved the northern portion as a park, to preserve the area that was once Fort Michilimackinac and to accommodate a hoped-for lighthouse. This was not built for nearly a generation after the land was set aside. Old Mackinac Point Lighthouse was built in 1892 in the same northern park that was originally allotted for its construction. This lighthouse would eventually replace McGulpin Point Light, which was built in the 1870s in the far western end of the village limits. The village became a vital port for train ferries crossing the Straits beginning in the 1890s, and later, for ferries for automobiles. In the 1890s, Mackinaw had one newspaper, the Mackinaw Witness, published weekly by Presbyterian missionary Rev. G. W. Wood, Jr.
Auto ferries began running in the early 1900s. Camping began in Michilimackinac State Park in 1907. 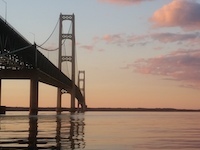 State Park Commission, which owned the property at the Bridge's southern terminus, to begin archeological excavations of the Michilimackinac ruins. Ultimately, a reconstruction of the fort to its 1770s appearance would be constructed. Auto ferries, which had been running since the early 1900s, ended in 1957 after the completion of the Mackinac Bridge. Train ferries crossed the Straits until 1984. Mackinaw City remains an important port city for tourists traveling by passenger ferry boat to Mackinac Island using the Arnold, Shepler's, and Star Line services. Through the course of time, the main industry of Mackinaw City became almost strictly tourist-oriented, with other major sources of employment being civic services such as mail, police, firefighting, schooling, and so on. Camping, which began in Michilimackinac State Park in 1907, was halted in 1971 as a Maritime Park was opened in 1972 around the lighthouse. This park was shut down in 1990, but Old Mackinac Point Lighthouse was opened to the public in 2004. Mill Creek State Park, which includes the area believed to be where Mill Creek's sawmill once flourished when Mackinac Island was being settled, is located about five miles (8 km) southeast of the village along U.S. Highway 23 (US 23). Learn, see and experience more of Mackinaw City history and sights on one of our kayak or stand up paddleboard tours. 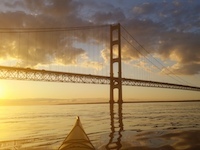 Paddle by the Mighty Mackinac Bridge, Old Mackinac Point Lighthouse, Fort Michilimackinac and much more on both Lake Huron and Lake Michigan. Come see why we are the number one tour on Trip Advisor for Mackinac Island and Mackinaw City! Reserve a Kayak Tour in Mackinaw City Online Now!